As the name represents, the Raw Veggie Picnic Salad is a perfect dish for keeping cold and taking to the outdoor gatherings like picnic and BBQ’s etc. This simple to make salad is palatable and has a flavorful taste. The vinegar-mayonnaise dressing gives a rich and creamy finishing touch to the Raw Veggie Picnic Salad. This recipe is a matter of few minutes to prepare and is enough to serve a group of 12 people. Though, an increase or decrease in the ratio of the salad’s ingredients is totally in your hand. Add the bacon slices into a medium skillet and set it on stove with medium-high heat. Now, cook it for few minutes or until evenly light brown. Drain the cooked bacon slices and crumble them properly. Leave until you toss together the remaining ingredients. 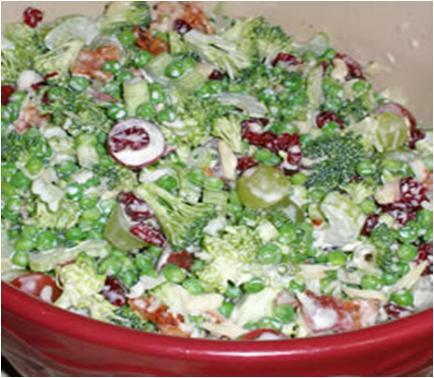 In a large serving bowl, place together the chopped celery, broccoli florets, frozen green peas, sweetened dried cranberries, chopped green onions, seedless green grapes, seedless red grapes, and the slivered almonds. Top the mixture with recently cooked bacon slices and toss these ingredients, holding the bowl firmly. Set aside and move on to make the dressing. Take another mixing bowl and whisk together the white sugar, white wine vinegar, salt, grated onion, mayonnaise, and the grated cheese (Parmesan cheese is preferred). Continue whisking until the sugar and salt dissolve completely, forming a smooth paste. Drizzle the dressing mixture over salad in the large serving bowl and toss lightly to nicely coat the salad’s elements. Serve immediately and enjoy nice remarks.